GEYAD for Commerce & Import Company (Geyad), a leading Saudi Arabian manufacturer of structural steel, pressure vessels, storage tanks and pipe spools, is exploring the possibility of launching more products in static equipment. The company is expanding by adding a new unit for shop fabrication of structural steel in Dammam Second Industrial city, says Geyad general manager Naif Al Butain. “We are also approaching Saudi Aramco for upgrading of our vendor qualification for pressure vessels and storage tanks to higher thickness and larger diameter respectively,” adds Al Butain. The company is a registered contractor and sub-contractor for prominent oil, gas, construction and industrial companies conducting business in Saudi Arabia and other GCC countries. Geyad was established in 1980 and has steadily grown to become one of the leading steel fabricators in the Eastern Province of Saudi Arabia. The main operational facilities are located in 77,250 sq m factory in the Second Industrial City in Dammam and in a storage yard on the Dammam-Riyadh highway in Dammam. The company has a total production capacity of approximately 20,000 tonnes per year (tpy), but also has the ability to expand total capacity to 25,000 tpy, if necessary. • Pressure Vessels: ‘U’ code symbol stamp pressure vessels in accordance with Sec VIII Div 1 standards of the American Society of Mechanical Engineers (ASME). Repairs and alteration of pressure vessels with ‘R’ code stamp in accordance with the standards of the National Board of Boiler and Pressure Vessels Inspectors (NBBI). ‘NB’ code symbol stamp to register ‘U’ stamped pressure vessels with NBBI. • Miscellaneous steel items: Handrails (straight and stair), ladders (with and without safety cages), gratings, chequered plates, stair and stair tread backstay holders and electrostatic precipitator components, skids and ducts. The company conducts the majority of its business on projects that are being executed in the Eastern Province of Saudi Arabia. 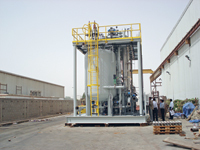 Its central location in the Second Industrial City of Dammam facilitates business with customers (oil related businesses and petrochemical industries, refineries and water treatment plants) who are also located in or near the Second Industrial City, which is in turn, in close proximity to Saudi Arabia’s vast natural gas and petroleum resources in the Eastern Province. The company has also targeted expansion of business opportunities into the Western Province of Saudi Arabia and neighbouring GCC countries, which are experiencing a period of unprecedented economic growth and high infrastructure and construction expenditure. Through nearly three decades of providing high quality work and on-time delivery, the company has built long-term relationships with many key companies in the GCC. Its key customers include JGC Corporation, Samsung, Techint, Saipem, Siemens; Petrofac, Nasser Al Hajry Corporation, MS Al Suwaidi, Mitsubishi Heavy Industries (MHI), Tecnimont, Hyundai Engineering, Saudi Basic Industries Corporation (Sabic), Samsung and Snamprogetti. Geyad is listed as a registered vendor in Saudi Arabia with Saudi Aramco, Saudi Electric Company (SEC), Sabic Services Limited, Marafiq, PetroRabigh, Saudi Iron and Steel Company (Hadeed), and Saudi Petrochemical Company (Sadaf). In the UAE, the company is registered with the Abu Dhabi National Oil Company (Adnoc) and Takreer, and in Qatar it is registered with Qatar Petroleum (QP). Geyad aims and commits to a continuous improvement of its quality and range of products and services to achieve the highest levels of customer satisfaction and world-class standards of the industry. “With better planning and dedication of our experienced staff we are confident of meeting the future challenges and competition successfully,” says Al Butain.